The main promotional tagline for KingBrowse is “Search Smart with KingBrowse”. It can be seen at the main website for the application at kingbrowse.co. However, if you click “Start Now!” button right below the tag line you will be redirected to the application’s download page and then to a totally blank ne page. It is enough to see that KingBrowse cannot be trusted, and if you happen to have this application installed on your PC, do remove KingBrowse at once. You may also need to terminate other potentially unwanted applications, because such apps as KingBrowse seldom travel alone. As far as KingBrowse’s origins are concerned, the application is developed by SuperWeb LLC. It is another version of Laflurla, Cling Clang, Rock Turner Ads and an extensive list of other adware applications that have been developed by SuperWeb LLC as well. All of these applications may seem like useful browser extensions that enhance your online search experience, but the problem is that despite all the claims the main reason why KingBrowse has been created is commercial advertising. We can see that something is off at the homepage already. Consequently, since KingBrowse cannot be downloaded at the official homepage, the application is distributed bundled with other freeware programs that are up for download on a number of third party file hosting web pages. Such software distribution method is not illegal and it is very common among freeware creators, but it also puts ordinary computer user at risk, because users seldom read all the installation steps through and through. If you overlook or skip an important step during freeware installation, you may not even realize that you install KingBrowse on your computer yourself. Once the installation is complete, the application is configured to run automatically each time you turn on your computer and it adds extensions to all main browsers (it is compatible with Google Chrome, Internet Explorer and Mozilla Firefox). When the application is up and running, rather than providing you with customized and relevant search results, KingBrowse displays banner ads on popular online shopping websites, such as BestBuy, Amazon or eBay. Perhaps some of the ads may help you purchase the goods you want at an optimal price, but you should avoid clicking the ads blindly, because they might be embedded with potentially corrupted content as well. 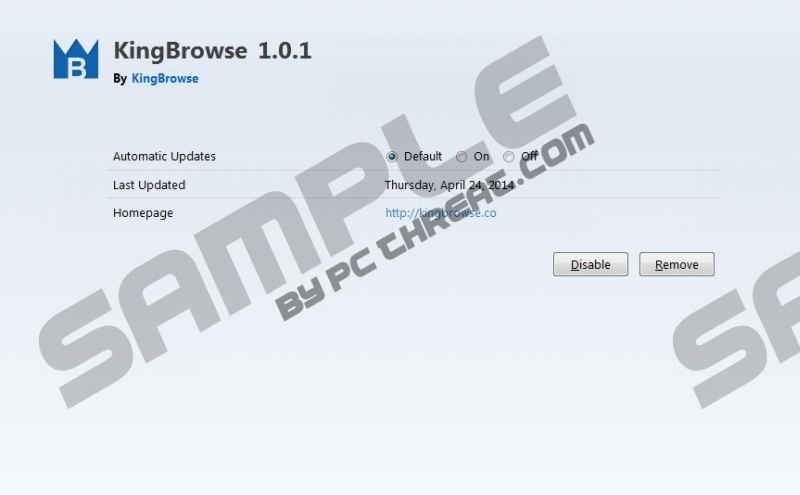 To avoid anything malicious, you ought to remove KingBrowse from the system and then scan the PC with a licensed antimalware tool to detect other potentially unwanted applications and files related to KingBrowse. It is very likely that manual removal via Control Panel does not terminate all the related system files and registry entries, so do not hesitate to invest in a powerful antimalware tool if need be. Click Settings (the gear icon) on Charm bar and then go to Control Panel. Select Uninstall a program and remove KingBrowse. Go to Uninstall a program and remove KingBrowse. Select Add or remove programs and uninstall KingBrowse. Quick & tested solution for KingBrowse removal.